27 November 2018 On The Ice! Submitted by Mike Penn on 27 November 2018. The airplane was dark inside and the light outside was so bright that I really couldn't see outside until I was out of the airplane. The cold air and the wind hit my face as I stepped down the metal stairs to the ice. I had to remember to think about not falling down the steps as I looked around. We were on a huge, flat expanse of ice that stretched for miles in every direction. The sun was bright and the white ice and snow made it even brighter. Sunglasses were a must. Walking to the "bus" to ride to McMurdo Station. 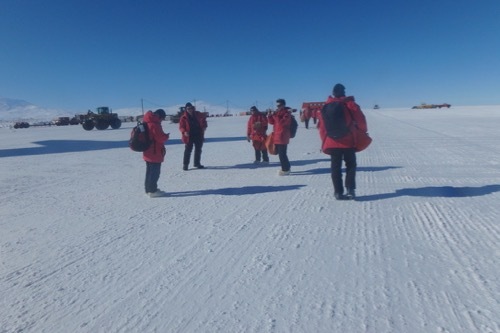 These USAP participants are walking from their C-17 toward "Ivan the Terra Bus" for transport to McMurdo Station, Antarctica. 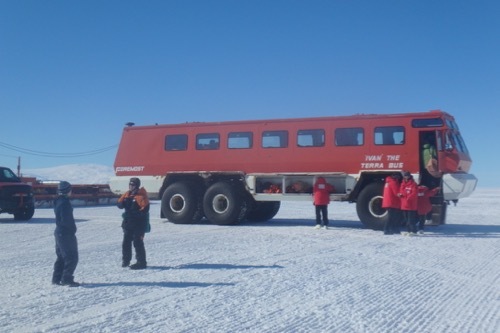 The iconic "Ivan The Terrabus" has been transporting USAP participants from the ice sheet airfield to McMurdo for decades. The internet connection is not very good and the science comes first (before my need to post pictures)! My team and I have been busy getting our laboratory space organized in Crary Lab, going through all of our required pieces of training and briefings and generally jumping right into our project. There is no time to waste, the summer here is very short. The station is roughly 3,864 km (2,415 miles) south of Christchurch, New Zealand, and 1,360 km (850 miles) north of the South Pole. Stay tuned, I have so much more to show and tell you about! Gage, Your question has been a popular one! I wrote a journal to answer this question check it out, it's the one with the picture of the "terra-bus" Thanks for reading my journals and taking the time to ask a question! Are you scared of the volcano? What is that bus? is a military bus or something else? Your question has been a popular one! I wrote a journal to answer this question check it out, it's the one with the picture of the "terra-bus" Thanks for reading my journals and taking the time to ask a question! Hi, my name is Faith I was wondering, how many people can fit in the bus? Why is the bus elevated so high. Your question has been a popular one! I wrote a journal to answer this question, check it out, it's the one with the picture of the "terra-bus" Thanks for reading my journals and taking the time to ask a question! What time do you have to wakeup and what do you eat for breakfast, lunch and dinner? 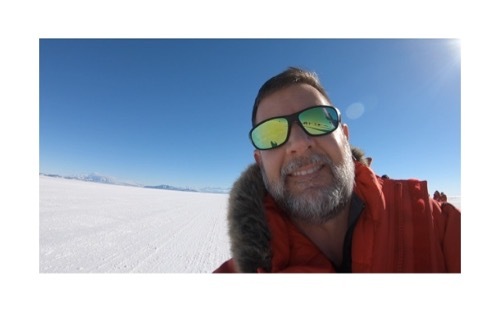 Camryn, Because the sun doesn't ever go down (24 hours of daylight) McMurdo station runs 24 hours a day. There are people working, flying out to field camps, working in the laboratories and eating at all hours of the day and "night." There is a "Galley" in building 155 that has established times for Breakfast, lunch and dinner at the usual times, but it is always open and we can get a nice choice of food any time we want! Hey I'm from kevins class and I was wondering how you get water in antartica? Nephi, That is a great question! Since we are on an ice-covered continent we are literally standing on miles of ice that can be melted into water...the problem is, of course...getting it to melt! Here in McMurdo Station, the water is pumped in from the ocean (under the ice) and a process called "Reverse Osmosis" is used to separate the salt from the water to make it drinkable (drinking too much ocean water will kill you). At the South Pole (I'll be there next week) water is made from melted snow. It is absolutely pure and clean. I'm looking forward to that! Why does the bus have six wheels instead of four? HI my name is Tyler from Kevin dickersons class, i was wonering if when you guys walk on the ice, does it feel like solid ground or is it like walking on snow? Tyler, that is a good questions and something that I was curious about before I got here. I'm actually going to answer this question in today's journal. The snow/ice was solid enough to land our C-17 cargo plane on! Fully loaded, that plane can weight over 250 tons! Yesterday when I was working out on the Ross Ice Shelf I really got to dig a hole in the ice to find a battery box that was buried in snow. The snow was much more solid than I expected. It could be cut into blocks and removed whole. I now understand how it is possible to make an igloo! The snow/ice that I was working in was solid and it was too dry to make snowballs out of. Try to check back tomorrow and read the journal that I'll post today to see some pictures and hopefully you'll be able to see the snow and ice in a few pictures. Are you required to eat certain foods? What are some of the things you guys get to eat? Anicia, the food here is surprisingly good! As you probably know, your body needs more food to burn just to keep you warm when it is really cold. So, most of the food here is designed to provide more calories than a similar cafeteria back home. The biggest difference between here and there is that here there generally aren't any "freshies." Any fresh fruits and vegetables are rare and valuable around here. Also, all of the beverages are...reconstituted. The milk has been powdered, shipped here, then the powder was mixed with the correct amount of water and made into milk again...mostly. The beverages have been a challenge to get used to. I'll write more about this in a journal in the near future. What type of sunglasses are those? Landon, my sunglasses are prescription (I wear glasses and contacts) from Nike. They are however, special for the snow. The have a special reflective surface to reflect most of the suns harmful rays and they are "polarized." Polarized glass reduces glare and blocks the harmful UV rays of the sun. It is common here for people to get sun blindness from the intense sunlight. It is basically getting a sunburn inside your eyes. So, everybody has and wears sunglasses or goggles when outside. Our project is installing and maintaining Automatic Weather Stations all over the continent of Antarctica (there are 59 for our project and 120 in total) I'll have a lot more on this in a future journal. Basically, Antarctica is huge and we just don't know that much about it. Our weather stations are positioned in specific spots to give us weather information (Temperature, wind speed, humidity, air pressure, and snow depth) that can be used to formulate an accurate picture of what the weather is all over the continent. Ivan is NOT the only form of transportation. In fact, Ivan is only used to go from the "Williams Airfield" ice runway to McMurdo and back. There are LOTS of other really cool and interesting forms of transportation around here! I'll be writing more about that in a future journal, so check back! Where was the nearest gas station for the bus? How long was the bus ride to the McMurdo Station? Amy, The bus ride was about an hour. The distance was only about 8 miles, but Ivan is rather slow. The "road" from Williams Ice runway to McMurdo is icy and when it crosses onto Ross Island it is very steep and rocky so we need to go slow anyway. This is so cool! What did you guys do when you were on the bus? Nick, I haven't seen any penguins...yet. We are expecting to fly out to Cape Bird where my teammates assure me that we WILL see penguins. I'm looking forward to that! I HAVE seen a bunch of seals off in the distance on the ice though! There have been a few Skua birds around too. I'll write a journal about the animals sometime soon! Connor, I see what you did there! Great and salty. It is "ice" to meet you too. Yes, I can see the similarity to the salt flats! Did the bus have a heater? Or were you just sitting in the cold bus for an hour? Melanie, The bus was heated! However, since we were all wearing all of our Extreme Cold Weather gear, it was really hot in there! So instead of freezing for an hour (which would have been better since we were all dressed for extreme cold) we baked for an hour inside our ECW gear and the heated interior of the bus! What is your main goal while your up there? Is it to like find a new organism or what? Isaac, Our project is installing and maintaining Automatic Weather Stations all over the continent of Antarctica (there are 59 for our project and 120 in total) I'll have a lot more on this in a future journal. Basically, Antarctica is huge and we just don't know that much about it. Our weather stations are positioned in specific spots to give us WEATHER information (Temperature, wind speed, humidity, air pressure, and snow depth) that can be used to formulate an accurate picture of what the weather is all over the continent. It can also be used to improve weather forecasting (which is critically important for transportation here). And, over long periods of time weather (what is the weather/atmosphere is "behaving" at a specific spot at a moment in time) can be used to describe the CLIMATE (how the atmosphere "behaves" over relatively long periods of time). All of the people on my team are Meteorologists, so this was an easy question to get answers for! How long was your walk? And who did you walk with? Tren, The walk wasn't too bad. It might have been about a quarter mile (400 meters) or so. The C-17 needs to have lots of space to be refueled and unloaded. It was actually nice to walk and stretch after being in the plane for 5 hours! Is it hard to sleep because of the sunlight hours there? Emma, Yes, that is a problem here, especially when you are in a tent at a remote field camp. Here in McMurdo it isn't so bad. There is a window in the room I sleep in, but we have cardboard taped over it to block out the sunlight and black-out curtains on top of that! I did bring a "sleeping mask" for when that just isn't possible. what was it like/ how did you feel when you first landed? were you nervous, excited, or anything like that? Ava, I was very excited! It was a lot of work to get here and I was so happy to finally step foot on the Ice! You were on the C-17 there and rode on Ivan the Terra Bus to the station. Are there any other vehicles or equipment that you use or used, such as snowmobiles or skis? Ryatt, There are lots of other types of transportation here. Many of them are very specialized. I'll have a journal about that...maybe very late tonight. There have been so many questions about Ivan the Terra-bus that I feel like Antarctic transportation requires its own journal. Stay tuned.